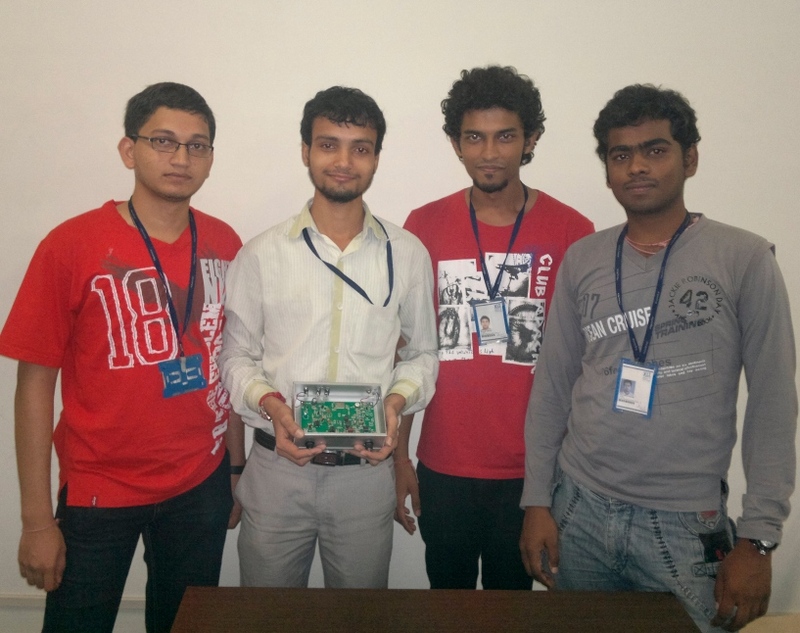 As a part of active learning we are establishing the VRAC at the Vidyalankar Institute of Technology, Mumbai. Our core committee consists of Prof. Saurabh Mehta (founder) and student members: Mr. Vinay Kumar, Mr. Vipin, Mr. Sohan, Mr. Pranav, and Mr. Vikas. 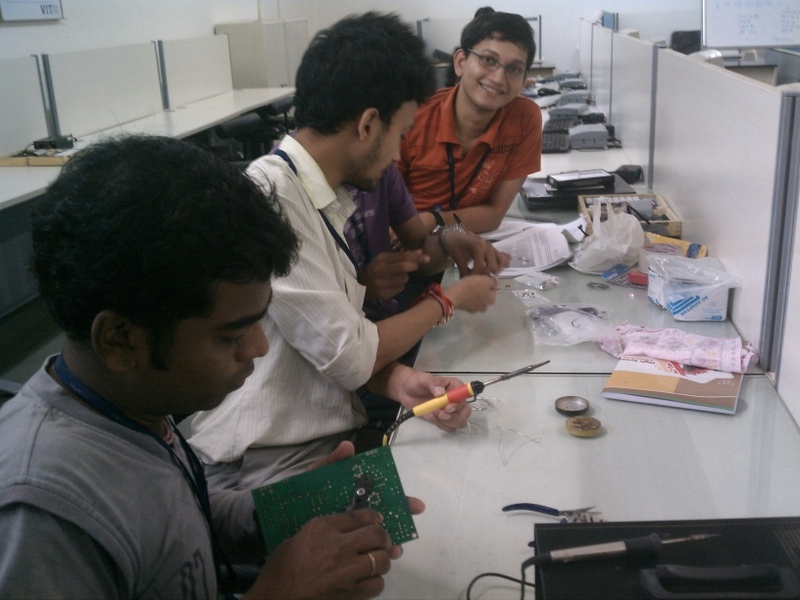 To train students in electronics, communication engineering, hardware/software development, etc. Figure 3. 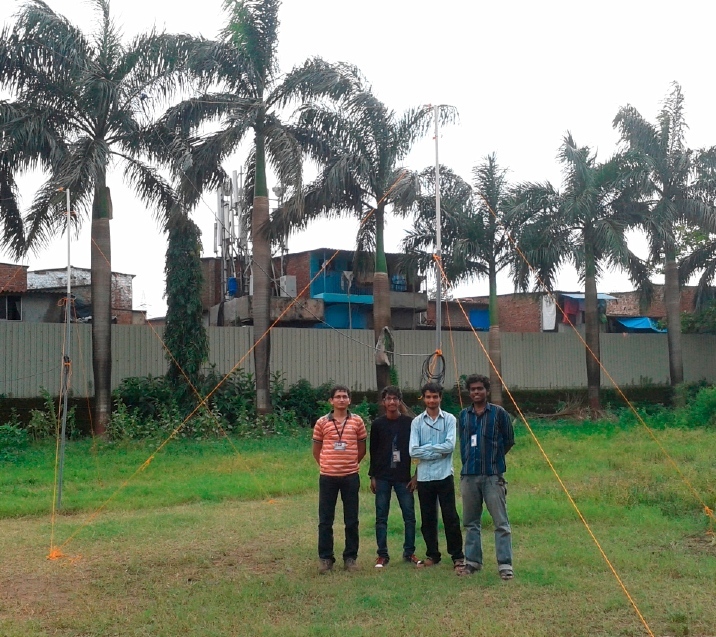 The VRAC team at their antenna installation in Mumbai. On 1 July 2012, two solar bursts were recorded at Agawa Observatory (Kochi, Japan), Reeve Observatory (Anchorage, Alaska) & Ducksuit Observatory (Lower House, UK). I discuss below the results from analyzing these two sets of synchronous records. In this article I provide an examination of the two bursts and a discussion on calibration. Martin Wright of Ducksuit Observatory has presented some details of these observations in the SARA Journal, 2012. Figure 1. The two solar bursts observed on 1 July 2012 from three widely separated sites. Burst Initiation Times vs. Frequency. I next studied the initiation times of the bursts and how they varied with frequency. My approach to determine the burst start time involved first identifying the burst initiation time by eye, then performing a distribution of the antenna temperatures in kilokelvins (kK) of the previous 100 samples to determine the upper 5% of these, next examining sequentially the samples that follow the latest of the distribution samples. This is to see if two sequential samples rise above the 95% confidence limit of antenna temperature and the previous sample. The final step is to take the time tag of the first of these two samples as the burst initiation time. 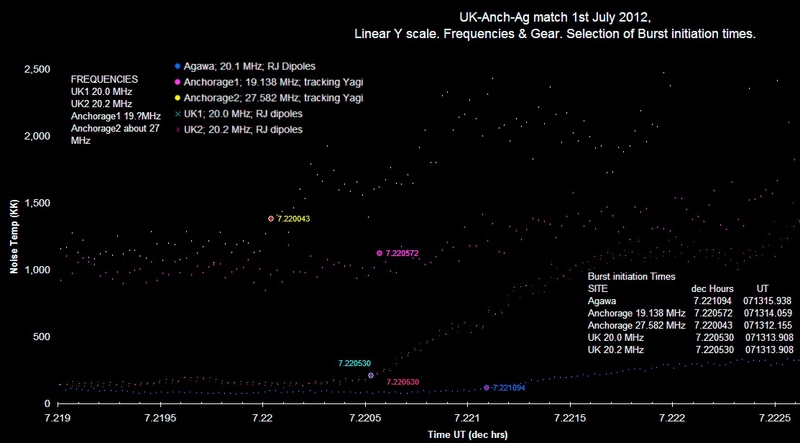 Discussion: Clearly the highest frequency burst (Anchorage 2, 27+MHz) has arrived first for both bursts. 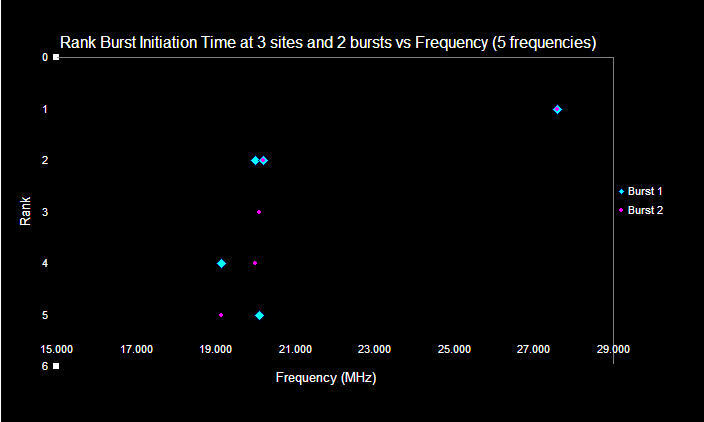 Equally the lowest rankings (4 & 5) show that that frequency (Anchorage 1, 19+MHz) arrives last. The significance of the remaining records in the graph for other frequencies is not inconsistent with the idea that higher frequencies arrive first. This, as I understand it, is the prevailing opinion among radio astronomers. Comparison of signal shape and Pre-burst dropout. In Figure 4, I have sought to adjust the presentation so that the signal shapes can be easily compared. This involved using a log y axis, and offsetting Agawa values (y/10) and Anchorage values (*10). Clearly there is great similarity between the Agawa and UK records. Such similarity is highly unlikely to have occurred by chance. This illustrates the importance of careful calibration, which enables these comparisons. Small variations are likely due to effects from the ionosphere. Figure 4. Comparison of signal shape and Pre-burst dropout. Now the data are presented on a log y axis and the data are offset in order to distinguish differences. 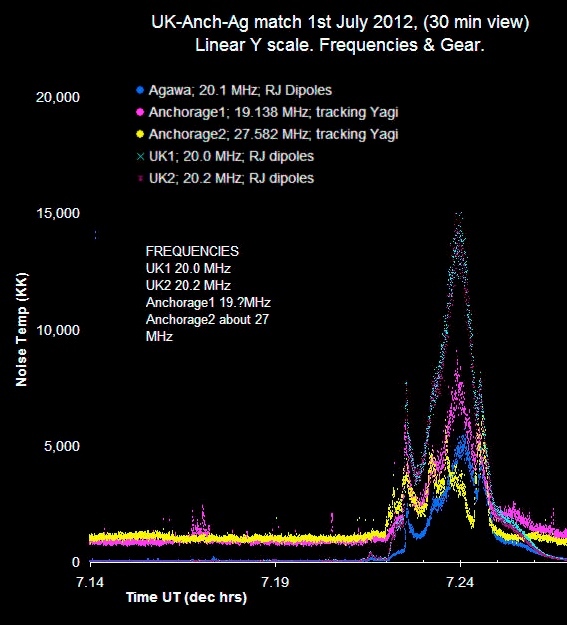 Pre-burst Noise Dropout (UK 1, 20.0 MHz, burst 2) The UK1 trace shows an interesting phenomena apparently associated with burst 2 (Figure 4). Prior to this burst the galactic background itself is relatively smooth (from 07.33 to 07.39), but riding on top of the background trace are speckled looking noise spikes. About 60 seconds prior to the onset of burst 2 this speckled noise drops out and then is seen to resume as the burst subsides. The cause of this is not immediately clear to me. The Long Wavelength Array (LWA) near Socorro, New Mexico is observing Jupiter. I co-lead a team along with Tracy Clarke from the Naval Research Labs (NRL) that received 100 hours of telescope time using the LWA1 instrument (see figures below). The telescope will be observing both Io-related and non-Io-related Jupiter storms from Sept. 2012 – Feb. 2013 in an effort to study Jupiter’s radio wave polarization and to help calibrate the telescope. We are observing Jupiter with two beams having 16 MHz bandwidths and center frequencies of 20 MHz and 28 MHz, respectively. The advanced electronics used by the array allows a full calculation of Stokes parameters to measure all polarizations and intensities. I will be receiving the first set of data very soon, and I hope to use Radio Jove observations from our participants as confirmation for certain Jupiter events. Please keep up the great observations as they are scientifically useful. I will be in touch via the email listserv for solicitations for Jupiter observations to help validate the LWA1 data. More information about the LWA instrument can be found here: http://www.phys.unm.edu/~lwa/index.html. Thanks for all the great efforts to observe Jupiter! Figure 1: All-sky observations with the LWA1 array at 25.6 MHz on Dec. 31, 2011. The left image shows the total intensity and the right image is intensity of the circularly polarized waves. The galactic plane is shown as the dashed line, and the radio sources Tau A, Cas A, and Cyg A are identified as is Jupiter. Notice that Jupiter is very intense in both images (i.e. strong circular polarization). Figure 2. LWA System Engineer Joe Craig works with student volunteers from the University of New Mexico to assemble an LWA antenna to complete the first LWA-1 station. The VLA is seen in the background. Credit: Helene Dickel photos, Oct. 2009. Figure 3. This is an aerial view of the LWA station 1 with Carl Jansky VLA in the background. Credit: Helene Dickel photos, Feb. 2012. 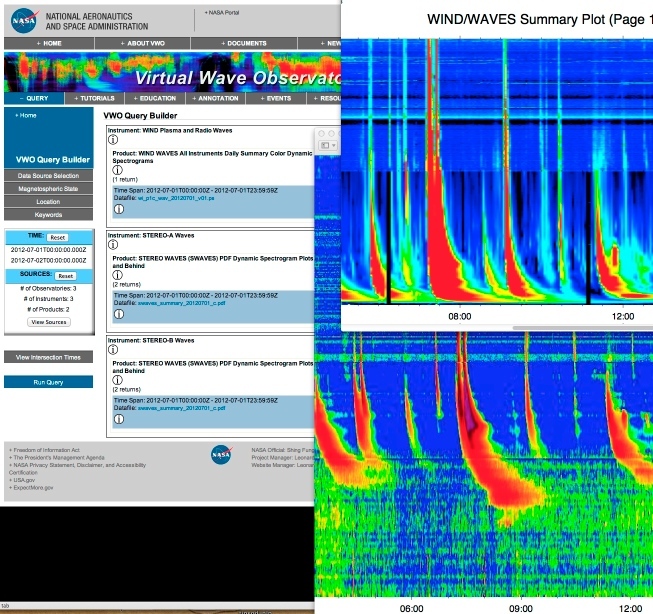 The Virtual Wave Observatory (VWO, http://vwo.nasa.gov) project was started four years ago as a resource to enable scientists studying radio emissions from the Sun, Earth and the other planets in our solar system to easily search for and compare a wide variety of radio wave data. The VWO is also interested in supporting the amateur radio astronomy community. The VWO Education page, for example, provides links to several wave-related educational programs. The Tutorial page provides documents that help users to properly interpret wave data. VWO provides several ways to access and view wave data. These data may be especially useful for amateurs who wish to confirm their observations against data from professional observatories and satellites. VWO Data Query Page This is the main interface to provide you with uniform access to a wide variety of data. You can specify a date range and the interface will highlight those data sets we currently have identified. We are adding new data sets frequently so if your favorite isn't there let us know that too. Much of our data is in the form of dynamic spectrogram (color-coded frequency vs. time) plots that you can simply view in your web browser. For the rest, we provide access to the Autoplot software that enables you to display the data on your computer. 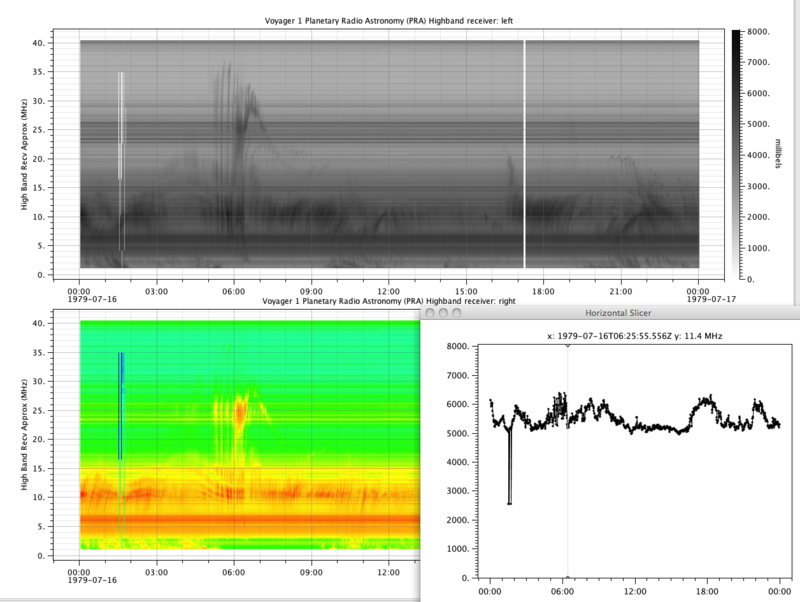 For the 2012 July 1 Type III solar bursts mentioned in the article above, the VWO can provide access to dynamic spectrograms from the Wind and STEREO spacecraft (Figure 1). These spectrograms span the frequency range from a few kilohertz to 16 MHz and show the two bursts very close to one another between 7 and 8 UT. Figure 1. Access to Wind and STEREO spacecraft wave data using the Virtual Wave Observatory (VWO). These data illustrate the Type III bursts observed on 2012 July 1. The data that can be accessed through the VWO represents decades of scientific research. For example, VWO enables access to the Voyager 1 and 2 Planetary Radio Astronomy receiver dataset durings its Jupiter flyby in 1979. The VWO provides static GIF images of these data that you can browse through or you can download the binary data files and through the Autoplot software (see Figure 2) you can zoom, change color and slice the data nearly any way you like. Stop by and try it out for yourself. Figure 2. The VWO provides access to a wide variety of wave images and data. 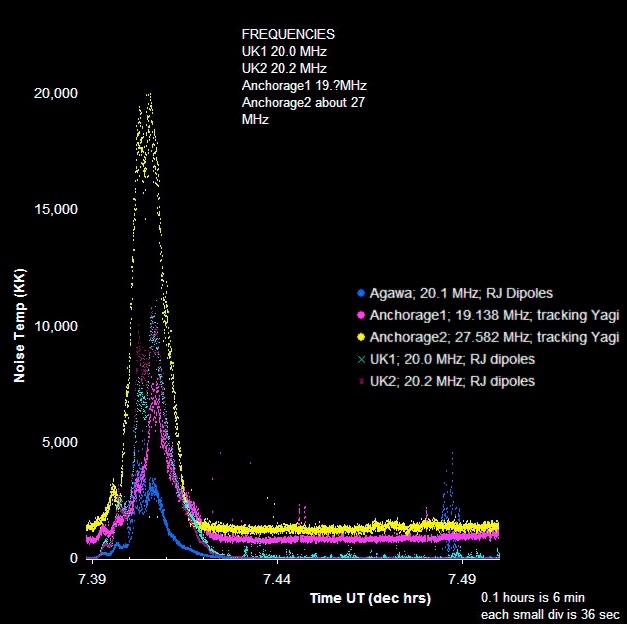 This example shows Voyager 1 Planetary Radio Astrononomy spectrograms and a slice through one at 11.4 MHz. With software on our site you can explore these data yourself. The Radio Jove Project now accepts payment via Paypal™. Our order form will soon be updated to allow you to click on a specific item to take you directly to a Paypal site to process your payment. Paypal accepts all major credit cards. The order form reflects new pricing to allow for credit card payments and easier bookkeeping. We hope that this makes it easier for people and organizations to participate in Radio Jove. Until the order form is officially updated, please go to the Paypal website and search for The Radio Jove Project, Inc. The contact name is Chuck Higgins and my email is chiggins@mtsu.edu. You can contact me through email and send your order form through email to avoid mail costs. Thanks for your patience while we get everything working smoothly. As we approach the maximum of the solar cycle and with a Jupiter observing season well under way, we anticipate the number of emails to our distribution list announcing observations of activity to increase. This will be good news to some observers but may impose a burden in e-mail traffic for others. Accordingly we have set up a new distribution list for those observers interested in submitting and receiving messages specifically about (often time sensitive) Jove observations.